It’s known as the Namche Bump. A climb of about 600 meters elevation. It starts with a mind-numbingly terrifying (for me anyway) crossing of a wire bridge, suspended high above a gorge and then a street, steep climb that takes in countless sharp hairpin bends in the path. The journey took us six hours, from the valley, over the bridge and up the bump and I enjoyed every single moment. The best moment of the climb was right near the top. The adults were busy chatting away and, for some reason, I mentioned that I was certainly not attempting to dress to impress on the walk. Behind me, a teenage voice quietly piped up, with the disdain that only a teenager can show when commenting on an adult’s behaviour, ” Obviously.” Thank you Rita. Watching this group of young people, all strangers four days ago, grow into a team, watching out for each other, is a real privilege. Holly, their (our) leader, a young teacher, is gifted. She knows just when to ask the right questions, when to step up the physical demands of the walk, when to pause and get involved in metaphysical conversation with two or three youngsters. And she does this whilst wearing a pair of yeti shoes on her feet rather than hiking boots. Today we’ve spent the day in Namchi Bazaar, acclimatising to the altitude. 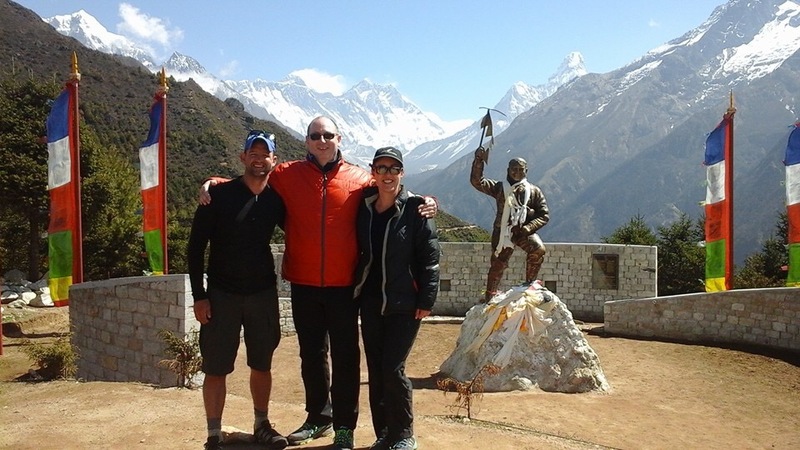 We climbed the hill to the national park and caught our first glimpse of Mount Everest. I’ve never seen a group of teenagers so quiet and so in genuine awe, particularly when we were joined by John Gully, who told them about the mountain and the people who have climbed it. If ever anyone wanted to see a model lesson in adventure education, they should have watched John today. The young people shopped until they dropped this afternoon – though with care, as they have to carry all their purchases in their day packs for the rest of the treck. This evening, we talked about youth empowerment, education, aspirations, religion and politics. I refused the invitation to join in a game of “Mafia”. I’m still not quite sure what it is. Tomorrow we climb some more – and the young people move under canvas for the official qualifying days of their Adventurous Journey.